In today’s post, we have 10 Invention and Concept Designs, you might find they are creative and useful; or crazy and acceptable. Check the post and let us know your thoughts. 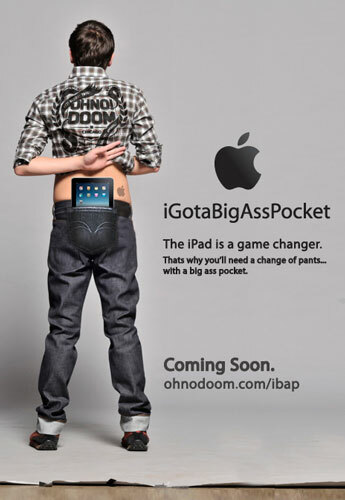 At this time it’s simply a concept with an amusing message, focusing on a product created by a company whom we respect to the utmost. Always be warned by your mom not reading while lying in bed…? 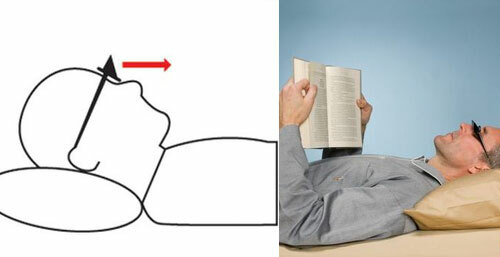 Check this glasses that allow you to read while lying supine in bed, eliminating the need to crane your neck. The lightweight glasses employ two optical-quality glass prisms that bend your vision 90 degree providing easy reading from a recumbent position. 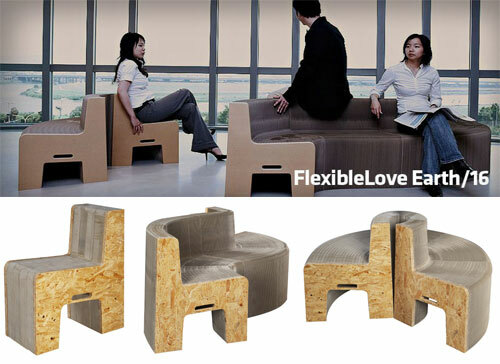 Equally useful while lounging outdoors on a hammock, chaise, or on the beach. 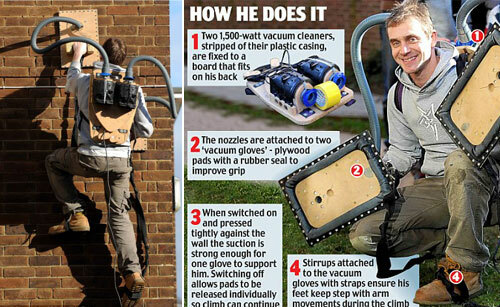 He adapted the household appliances’ motors into giant sucker pads, then used them to crawl up a 30ft wall. Get annoyed by Mosquitos? There is a company inventioned an equipment which is capable of shooting down not one but 50 to 100 mosquitos a second. 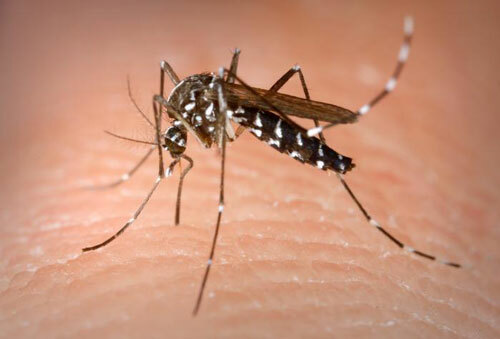 The system is ‘so precise that it can specify the species, and even the gender, of the mosquito being targeted.’ Currently, for the sake of efficiency, it leaves the males alone because only females are bloodsuckers. Best of all the system could cost as little as $50. It is always hard to get some sleep on the bus…Someone stole your bag, kids sitting next seat were screaming, the nap in the bus sucked and now you have a muscle pull in the neck! 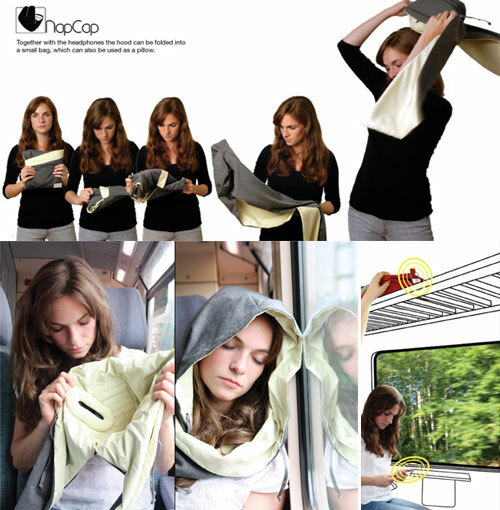 Hence, designer Simone Wittmann came up with this idea: Napper, which is a set of comfy hooded shawl with concealed earphones (that work with Bluetooth), combined with a Bluetooth lock for your luggage, and NapApp. The hood’s inlay is padded with 3Mesh material, which has a soft cushioning effect and high shock absorption against the vibrating windows. On the outer side of the headphones is covered in Sorbothane, a plastic foil which has noise absorbing properties. 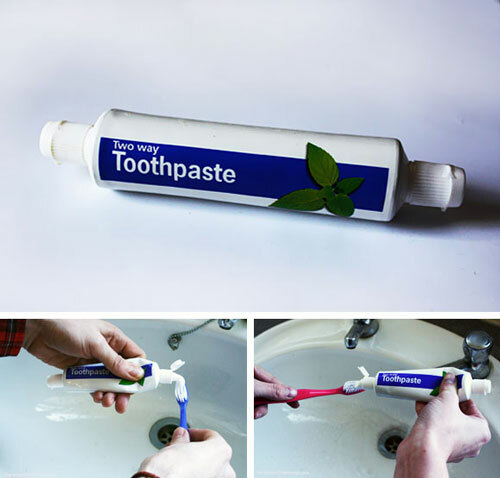 I guess with this design, no one will get angry with their partner for squeezing the toothpaste from the front. Simply open the other end and squeeze from the back as demonstrated below. Also quite useful for getting the last of the paste out of the bottom. 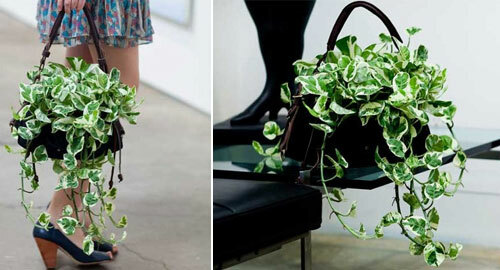 I don’t have much comments for this handbag, but I have to see, it does look weird to me. From designer: Woolly Vagabond gracefully hangs from the ceiling and stands on the table. Best of all, he travels about town. He’s your personal breath of fresh air and will accompany you to the museum, on picnics and out to dinner. Just like all Pockets, Woolly Vagabond promotes healthy plant growth via breathable sides which release excess moisture and aerate soil. He also has a built-in moisture barrier to help keep your car seat and café table dry. It is said, lots of people died in fire because they inhalated deadly gas or asphyxiation instead of being burned. 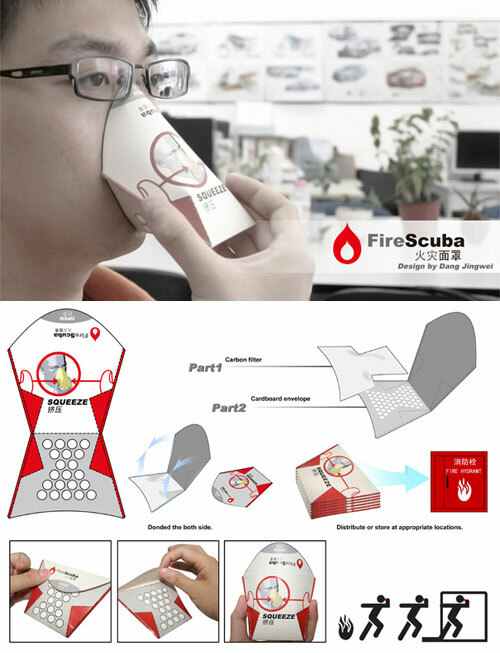 A simple design using cardboard and carbon filter, it cups your mouth and nose to facilitate easy breathing (through smoke) till help arrives. Sometimes small things like this make the difference between life and death. The name of the project is “Stiletto Police”. 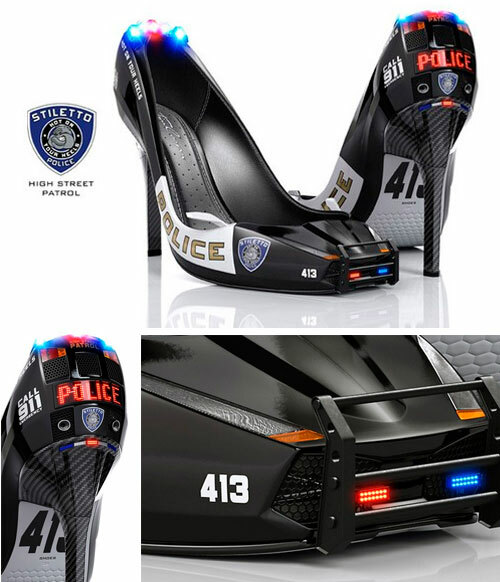 It is a pair of stilettos that have the outer decals of a patrol car and not only that, it has LED lights which turn on and off, shining blue and red lights all around to warn bad boys to keep their hands off you. We live in an explosive time for fashion. Bright lights, low brow, express yourself. Applause is given to those who don’t hold back. And this shoe is definetly something to put you in the focus…of course, if you can walk in heels. Next story Amazing Landscape In Jell-O! Delicious! I CANNT FIND ANY HELPFUL INVENTIONS!!!!!!!!!! !